Sunday-only Acela Express Blitzes Marcus Hook—December 4, 2016. The former Pennsylvania Railroad south of Philadelphia is an electrified multiple-track raceway. Decades ago this was the stomping ground of the railroad’s famous streamlined GG1 electrics. Fastest of today’s trains is Amtrak’s Acela Express. The long tangent at Marcus Hook, Pennsylvania offers a good place to watch and photograph these fast trains at speed. 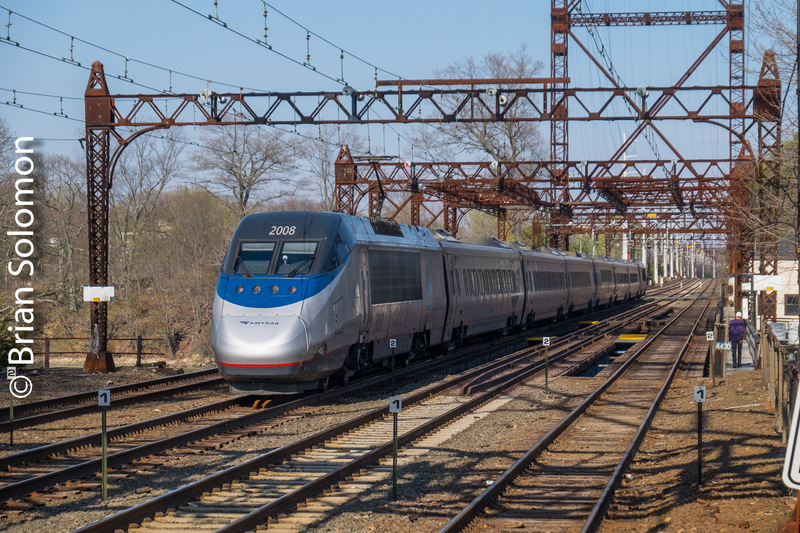 Last Sunday, Pat Yough and I paid a visit and photographed Sunday-only Acela Express 2211 on its run to Washington D.C. Exposed using a FujiFilm X-T1 digital camera with an 18-135mm Fujinon lens set at 135mm (equivalent in 35mm camera terms to a 203mm focal length). ISO 400; shutter speed 1/500th, aperture f8, camera set manually, but using autofocus. Amtrak Acela at Speed; when one thousandth of a second isn’t fast enough. Madison, Connecticut: until June 2016, I’d never made a photo there in my life, and as it turns out I was there twice inside of a week. This isn’t really a coincidence; having scoped the location on June 7th, I returned a few days later to make the most of light on the long days. I exposed these views from the Shore Line East station of Amtrak’s westward (southward) Acela train 2173 flying along the former New Haven Railroad Shoreline route. For this angle, I employed my FujiFilm X-T1 fitted with a Zeiss 12mm Tuoit and a graduated neutral density filter (to retain sky detail). My shutter speed was 1/1000th of a second. I had the motor drive set on ‘CH’ (continuous high), a setting I descriptively call ‘turbo flutter.’ This automatically exposes a burst of images in rapid succession. Normally there’s only nominal differences between the frames, but in this situation the train’s rapid motion combined with my super-wide angle perspective resulted in considerable changes in the relative placement of the head-end. Amtrak Acela 2173 at Madison, Connecticut. Also, as it turns out, 1/1000th isn’t fast enough to stop the action. Maybe next time I’ll try 1/2000th. Tracking the Light Posts New Photos Daily. Spain’s Elusive Broad Gauge TGV. We’ve all seen photos of the French TGV, and the German ICE. Yet, Spain also operates a high-speed railway network. While it’s AVE system uses the European gauge, its rarely photographed Euromed rolls along on Iberian broad gauge tracks. Back in September 2001, I was traveling in eastern Spain with Denis McCabe and we made a project of seeking out this curious and elusive speedster. Exposed on Fujichrome Sensia 100 using a Nikon F3T with 180mm lens. I made this image of the Euromed westbound at Sagunt, where it was overtaking a local all-stops train. Before I made photographs of the EuroMed, I’d never before seen an image of the train in print. Even today I’d argue it is Europe’s least photographed high-speed train! Any wagers?